In this series of articles, I’m going to discuss some basic exercises that everyone should be doing. I’ll tell you how to do them and why they’re important. This week: The Push-Up. What does it do? – The Push-Up is a classic and versatile upper-body strength exercise that works your chest, shoulders and triceps as well as your core. How do I do it? – Lie down on the floor face down. Place your hands just below your shoulders with your elbows at a 45 degree angle to the body. Keeping your core and glutes tight, and everything from head to toe in a straight line, push yourself up until your arms are straight. 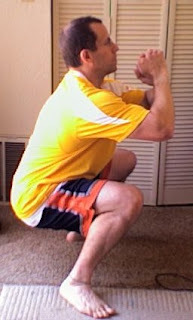 While in the lowering phase, lower yourself until your chest or nose hits the floor. Keep your eyes looking at the floor. Simple, huh? But, as I said before, it’s an incredibly versatile exercise and can very simply be made easier or harder. For many people doing them with their hands on the floor can be difficult. While you will see people doing them on their knees, it is much better to stay on your toes, but with your hands on a bench or table or even a wall. Doing them from your toes contributes to the full body emphasis of the exercise by forcing you to stabilize your core in a way that doing them from your knees doesn’t. Just be sure that wherever you have your hands, you are able to do full, complete reps.
For people that find this exercise too easy, we get to use our imaginations! Let’s see, if putting your hands higher makes it easier, wouldn’t putting your feet higher make it harder? Genius! Put your feet on a bench or, to increase the core work, put them on a stability ball. You can also change your hand position and emphasis by putting your hands at ear level instead of shoulder level, or by placing your hands together with your thumbs and first fingers touching. A great way to work on your power is the clapping push-up. Just push-up hard enough so your hands come off the floor and clap before you come down. People tend to forget about the push-up as they become strong enough to bench press heavier weights, but that would be a mistake. There are many very beneficial ways to incorporate push-ups into a program for exercisers of any level. It can help with cardio-vascular work, strength, power, fat loss and more. If you’d like some ideas on how to incorporate push-ups into your program drop me a line, and don’t forget to consult your doctor before starting any exercise program.